As the weather is getting cold and windy, your lips definitely need some moisturizing and nourishing to look and feel good. 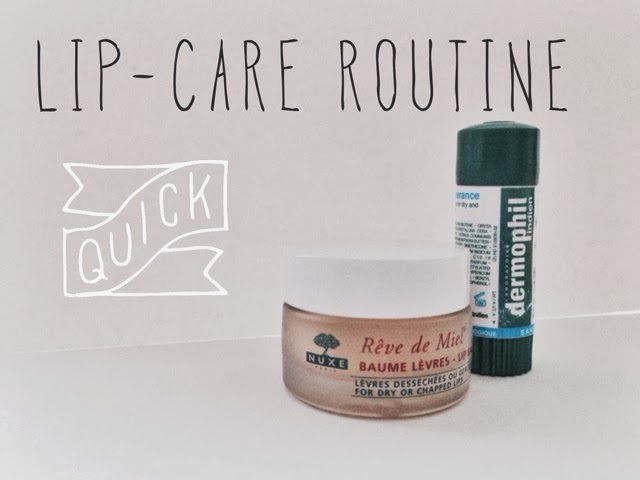 This is a simple routine to prevent the chapped lips. First of all I always take my lip balm/treatment with me wherever I go. Once your lips feel a bit dry, you just pop it on and they directly feel moisturized. The best one I think is the Dermophil High Tolerance. It is easy to use and small enough to put it in your pocket. Plus it replenishes moisture and really restores softness to your lips. But for someone that has very dry lips it can be not enough. Another thing I like to do to keep them nourished is putting Nuxe Reve de Miel lip balm just before going to sleep. It just changes everything. When you wake up your lips are very soft and they do not feel dry throughout the day. 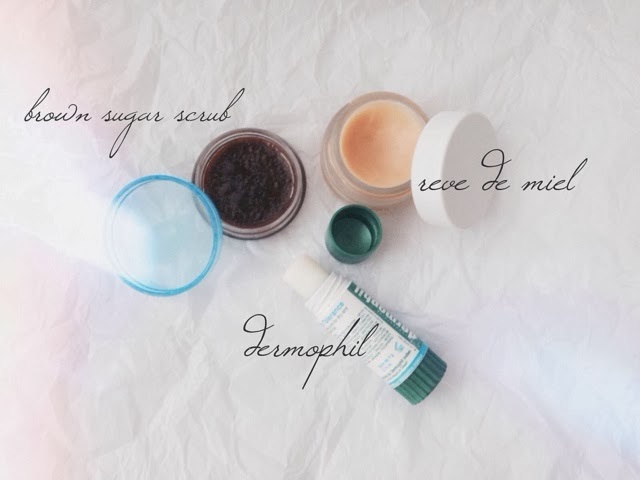 Apart from that, when you feel that you need that extra-something-special, I tend to use a handmade lip scrub. It has really amazing all natural ingredients in it. Honey, for example, has the best effect on your lips, especially if your lips feel flaky, you can just put it as a mask for 5-10 minutes and rinse it off/eat it after. Your lips will be as smooth as they have never been. Plus it is super easy and super fast. Feel free to vary the ingredients, you can change the macadamia oil for some other oil. I really like using sweet almond one for example, but you can even take some olive oil or some other one that you have in your kitchen. I will suggest taking the refined one though just because otherwise it can have a funny smell. You need the oil to make sure that the sugar will not dissolve into the honey. First, mix sugar and oil together, add some oil if you feel that sugar is not completely covered. It should look kind of like a paste. Now its time to add honey and cinnamon. Mix it all up and you are done! Quick and easy, it is ready to use! Keep the rest in the fridge and you can repeat the treatment every other day if you want.